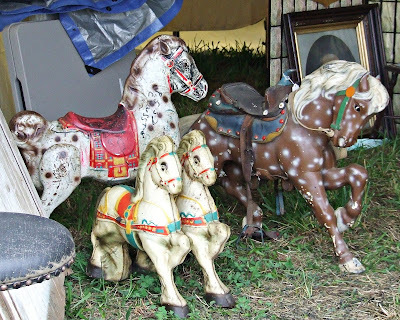 Horses were a trend at this year's Liberty Antique Festival. Neat yellow cart, vintage cake holders and a collection of car emblems. Original, old school clocks. I bought two! Original 1940's shopping cart. It was a great price...I got it...what was I thinking?!?! Rain and mud didn't stop this year's Liberty Antique Festival. I managed to snap a few photos of items I purchased including two old school clocks and a vintage shopping cart. I was hesitant to buy the small shopping cart because well...it's a shopping cart! Plus, I don't have the space for it...no clue what I'm going to do with it...but the price on this unique piece was too good to pass up. My brain racked with obsession and my gut said GET IT. So, I did. It's in the basement waiting to debut in an awesome shop somewhere. Hello Anthropologie...don't you need a vintage shopping cart for display? It's a stretch, but hopefully I haven't become a crazy, vintage bag-lady for buying an old (but cool) shopping cart! Ha! You'll find a way to make it look cool. I had a similar love/regret relationship with something I bought at last year's festival. I also almost swooped up that yellow cart you've pictured. Thought it would make an excellent night stand. maybe you could use the cart in the laundry room. 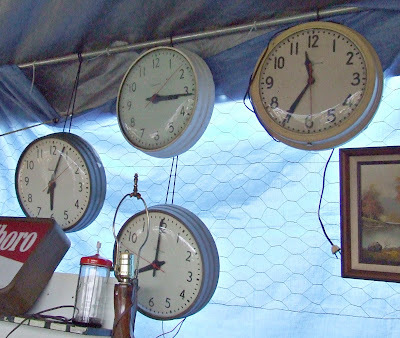 i love those clocks! Oh I love the laundry room idea. The former owner actually used it in the kitchen to store groceries. I was also thinking about having it on a screened porch with plants or in the garden. hahahahaha! i love that you HAD to buy it! hmm, i think it'd be great re-purposed for some kind of storage. you must tell us where it ends up! 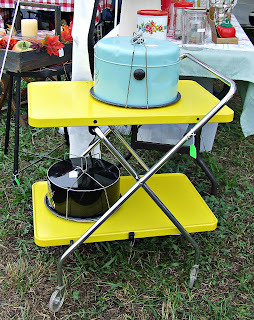 I also love the yellow cart...wouldn't that make a fabulous bar cart with all sort of old glassware from the 40s and 50?! One of my dear friends took her senior pictures in a shopping cart. They were wonderful. Also? CLOCKS. Am needing a clock badly. haha, i was going to mention the post over on city sage as well, i saw it earlier this morning and then saw yours and had to dig to find where i'd seen it! but i love the laundry room idea...that could be super-cute and practical as well. we're headed to Roundtop tomorrow for the huge show. i hope i find some wonderful things. ooh, I love that yellow cart. 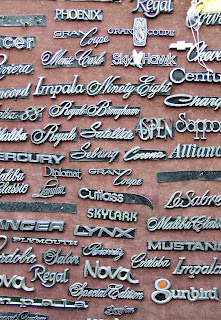 i love the cart and the car emblems! Oh, I'd love to have a vintage cart for all my magazines:) Or dirty laundry or something. Looks like an awesome event! Wish i could be there! soo many gorgeous things! You scored well! I love the old shopping trolley! Great finds especially the school clocks! I hope to go to the Kane County Fair this weekend! I could have a wall full of those clocks. And I agree with the laundry room idea...although I'd have no room in my laundry room for that! I'd of snapped up that cart too. What fun! How absolutely uncanny and wonderful that we both posted shopping carts yesterday! It's so odd too, because I've been sitting on that photo for weeks thinking, 'should i post this? is it too weird?' but i decided that though weird it is also wonderful--and the timing couldn't have been better!!! Can't WAIT to see what you do with yours! I really love the cake holders and cart. That would fit perfectly in my home. Great finds! Anyway. Long comment - sorry! haha. that's awesome that you got it. i like the cart! i bet it looks all vintage-y up close. I'm in love with everything vintage so this was lovely to look at. I'd buy everything there if I could!! How fun!! I love turning cool things into what I call "sculpture." What about turning the cart into a photo display...you could put the photos on with cool magnets..
the possibilities are endless...great find! How awesome! 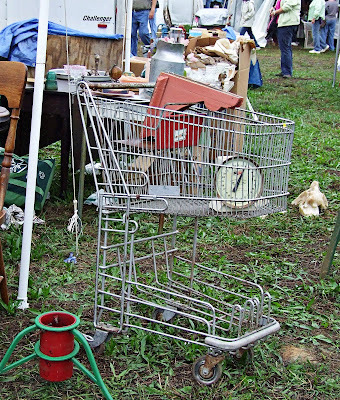 I love that you bought an old school shopping cart. It would be fun to keep in the laundry room. Don't you think shopping carts were smaller back then? Did we grow more of our own and didn't need such big trolleys, or make more of our own cakes and breads, or something - maybe we just ate less?